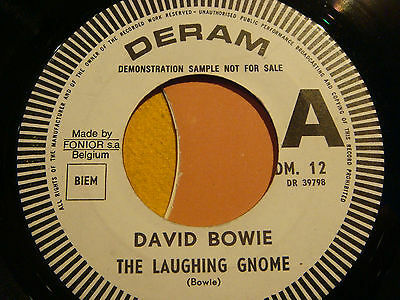 THIS IS THE HOLY GRAIL OF THE BELGIAN BOWIE ITEMS TOP ! IT'S JUST SECOND TIME THIS ITEM COME ON EBAY FOR SALE !! from a famous Belgian radio dj .... , he was dj from the Belgian National radio station between 1965 and 1978 . In this time he collected all these rare vinyls, (keep in mind that this is his PRIVATE COLLECTION and not the radio collection !!) . meanwhile he was also Salesmanager for Polydor / Verve / Deram Belguim. all lps stayed in Belguim in boxes in a dry room for nearly 20 years ! In this collection you gonna see nearly all first pressings in MINT or NEARMINT condition ! you into a state of mind numbness, the discription is what you get !! ( as i'm sure you all have ), so i am very aware of the need to grade correctly , i hope the foto's do this 7" justice , as it truly is ! HAVE A NICE BID !! STAMPED MATRIX NUMBERS SIDE ONE DR-39798/1 AND SIDE TWO DR-39799/1. SLEEVE CONDITION DERAM COMPANY SLEEVE IS SUPERB AND EX++ CONDITION. He is famous here , but if you don't like it , you can always find another Deram sleeve in mint condition for it !! THE SINGLE WILL BE SENDED INSURED WORLDWIDE FOR FREE !! !